TORERO STADIUM (11/15/2014) With Valparaiso leading 27-26 with just four seconds left to play, the University of San Diego Toreros (9-1, 7-1 PFL) needed a miracle and they got it. 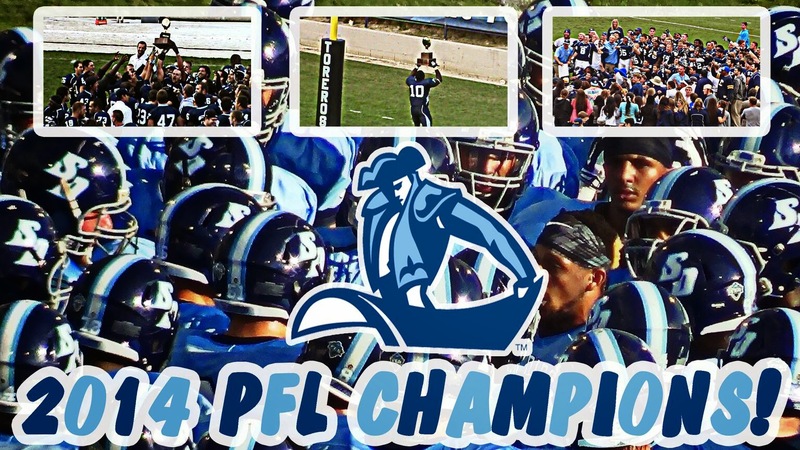 Keith Williams’ 44-yard hail mary pass fell into the hands of senior Brandon White in the end zone as time expired, and the Toreros earned their eighth straight victory and the Pioneer Football League Championship, their third in the last four seasons. The 32-27 win over the Crusaders (3-8, 1-6 PFL) also guarantees their first-ever bid in the FCS Playoffs. Williams completed 19 of 33 passes for 263 yards and four touchdowns, receiver Reggie Bell caught five passes for 110 yards, and White added five catches for 78 yards and two scores. Leading the ground game was Jonah Hodges, who broke the 1,000-yard mark after rushing for 168 yards on 20 carries. On defense, senior Troy McClelland posted six tackles (one for a loss) and an interception. After two field goals by David Last put the Toreros up 6-0, a 45-yard touchdown run by Brandon Hall gave Valpo a 7-6 lead early in the second quarter. Touchdown catches by Chris Campano and Brandon White put USD up 20-7 in the third quarter, but the Crusaders kept fighting back. Ben Lehman's 64-yard connection to Andrew Cassandra cut the Torero lead to 20-14. The Toreros answered back late in the fourth quarter with a five-yard touchdown catch from Justin Priest, but Valpo refused to go away. The Crusaders put up two straight touchdowns, including a three-yard pass from Lehman to Spencer Pennington that gave them a 27-26 lead with only 28 seconds left to play. Next week the Toreros host Cal Poly in the regular-season finale before kicking off postseason play.